We can all finish this line, but does anyone even really know what a chestnut is, let alone, taste like? When Jan came home with a bag of chestnuts, he was going to help me and some of our friends find out. He described the smell of roasting chestnuts as typical European street food in winter—recalling vendors roasting them on the sides of the street for people to enjoy from paper bags. Uncooked, the nuts are covered in a hard shell and are smaller than an apricot and larger than a cherry. The other night, Jan had just made all of us a delicious dinner, and we had dessert waiting for us. But this was pre-dessert, he said. And despite our full bellies, we were going to try this. So while he got to roasting, we cracked open Jan’s culinary bible (On Cooking) and got to educating ourselves about the chestnut. Here’s what we found out: chestnuts are called “true nuts” because they must be cooked before using. They are available steamed, dried, boiled, roasted, or as sweetened or unsweetened canned puree. Chestnut trees are in the same family as oaks, which explains their similarity to acorns. Some cultures have used ground chestnuts as their main source of carbohydrates, and the flour can be used to make breads and cakes, though the flour does not rise. Other important info: before roasting chestnuts, an “x” must be cut into them so the steam can escape, otherwise they will explode. A few minutes later, with the house smelling fragrantly rich and sweet, Jan presented us with a bowl of the oven roasted chestnuts, which we immediately got to work peeling. Chestnuts are a bit like hard boiled eggs, the longer you wait to remove the shell, the harder the work will be. So even though our fingers were burning from the heat, we quickly worked to remove the outer husk and after that, the second fuzzy shell. Inside, the texture of the chestnuts was firm, yet spongy and able to break apart if torn (think texture of a raw white mushroom). And you’d be surprised if you were expecting them to taste like other nuts such as almonds or pecans. The taste was sweet and earthy, somewhat resembling a sweet potato. Having tried the chestnuts, I can’t say I’d want to eat them again (or perhaps they are an acquired taste?) 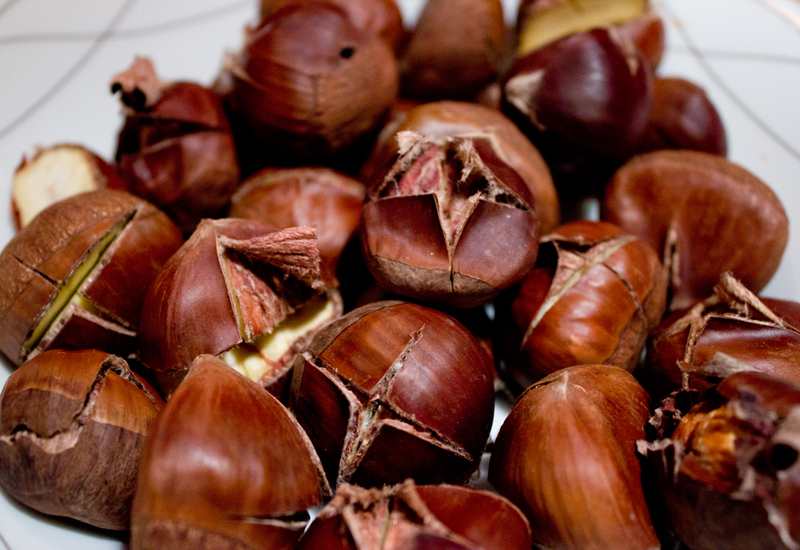 Quite the opposite of blue cheese, chestnuts smell better than they taste. But, there is something about the aroma of chestnuts roasting (not on an open fire, in our case—we used the oven), that embodies winter and all that goes along with it—cold weather outside, and the warmth and coziness of being with good friends inside. Haha, agreed! Worth trying, but they won’t be on my must-eat list! I agree, they smell better than they taste. I saw Lidia Bastianich make chestnut and mushroom pasta and decided to try it. I waited until Idaho had its chestnut season, usually around November and used the last of the locally sourced mushroom. The sauce thickened as expected and the flavor paired nicely with the mushrooms, but the texture was awful. It was very mealy. I don’t know if there is a better way of making it.